A good book makes you want to live in the story. A great book gives you no choice. So Iain Rob Wright. I have been open and honest enough over this past couple of years to whole heartedly admit I love his stuff. I think he is a fantastic writer and one of Britain’s brightest talents. I know him personally as well. Some people would say this will always result in a biased review. Iain knows me better than that. If I read something of his and though it was utter crap, I would tell him, and you. Also the fact that I know him as a friend doesn’t get him any favours when it comes to Confessions of a Reviewer. The fact that The Gates was released in August and I am only getting around to reading it now should bolster that fact. One question remains then. Is The Gates utter crap? Let’s find out. The world is carrying on as normal for people on every continent. Everyday lives continue with boring routine. Until the day mysterious black stones appear in random locations, in every country of the world. When people approach the stones they die. No one who touches them survives. This situation repeats itself no matter where the stones are located. Then they start to open. When they open, they literally open the gates to hell. 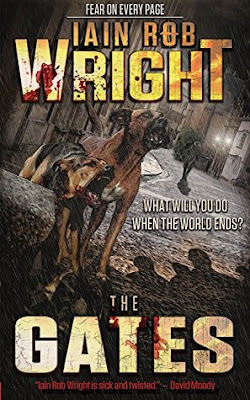 As demons and fallen angels storm out of the newly opened gates, people all over the world must fight. The fight is for survival and to try and find a way to defeat this seemingly unbeatable army from hell. Millions will die but a few will rise to the occasion and find courage and fight within themselves and a drive to try and save mankind. But is it too late to close The Gates? So what do we have characters wise in this one? Too many to mention individually by name. We have people all over the world that find themselves in seemingly pointless situations where survival is impossible. Some to highlight would be: Mina, a photographer with a small newspaper in England. She is battling her own demons, as in her father, along with the hordes of demons roaming the streets of London. A timid girl, she soon finds a fighting spirit within her that many men would envy. Guy Granger is the captain of a USCG vessel, The Hatchet. He sees first-hand the sort of devastation the demons can cause. He also must battle against his own conscience to try and find the balance between what his country demands and what his heart demands. Tony, a British soldier fighting on the Syria / Iraq border that must keep his men safe, but at the same time make difficult decisions on who to trust. Rick, the one hit wonder pop star, again battling his own demons of family and alcoholism, as well as trying to keep new found friends safe. You get the picture? Everyday people that all have their own everyday struggles, thrown into a situation where the world is going to end if they don’t rise up and fight the good fight. The demons and “fallen angels” in this are pure terror. They are hell bent on the total destruction of mankind. No one should survive if they have their way. They have been trapped in hell for many decades and they finally want to have their revenge. But there are other side agendas that no one is really sure about. And that is the plot as well. The gates have opened and the demons want to destroy the world. The humans must survive. But how? No one knows. They initially don’t know how to defeat the demons. They don’t know how to stop them flooding from the gates. They know they must close them but don’t know how. It all seems impossible. There is no hope. That is until the human spirit comes to the fore and people start to fight back. They soon seem to realise they have no choice and they are going to die anyway so they must fight back. So to question number one. Is it utter crap? Absolutely not. Earlier this year when I read Mr Wrights The Picture Frame, I gushed about it saying it was probably the best thing he had ever written. I mentioned then that his writing had matured in so many ways and pointed to the fact that his endeavours to finely tune his craft where paying off big time. With The Gates Iain Rob Wright has, in my opinion, crossed to another level in his writing. Previously I have loved his style of writing because his stories always revolve around a sort of homely, suburban people. Normal people who suffer terrible things in his stories. The Gates has stepped this writing style up about fifteen gears. This story is worldwide. It’s not just set in one little town or one country. It’s everywhere. One portion of the story has you running through the streets of a large city hiding in shops and doing whatever you can to stay safe. Another has you in the country where things seem to be more settled and a bit calmer. The next bit has you fighting all sorts in the middle of the desert in the Middle East. The next has you on a boat in the middle of a battle with evil that would be the envy of any Hollywood director. This story has it all and in writing it Mr Wright has certainly proven to me that he can write anything. The change from low budget suburban horror to worldwide Hollywood blockbuster is seamless. It all flows together incredibly well and makes it all believable. The people in this story are all described as normal people as well. They all sound like someone we know. Many of us will even see traits in many of the characters that we ourselves have within us. There are no huge big characters that take over the story in a heroic sort of way. They are all believable, everyday people, trying to live. I loved this aspect of the story because no matter who reads this will be able to relate in some way. I read somewhere that he was going for a feel of The Walking Dead combined with an epic story with The Gates. I’m sorry for any fans of The Walking Dead but this story tears strips off it. This could easily be made into a first class television series or film franchise that would keep the world entertained for years to come. I know there are more books planned for this series. I cannot wait to read them. The story is only getting started in The Gates and there are a lot of unanswered questions and a lot of exciting sub plots that need to be finished. If you want an apocalyptic book that has everything, this is it. To summarise: just buy it. Seriously. The end. ★★★★★ scared the bejesus outta me. If you would like to help support Confessions of a Reviewer, then please consider using the links below to buy The Gates or any other books from Iain. This not only supports me but also lets me know how many people actually like to buy books after reading my reviews. What will you do when the world ends? That’s a question that needs answering quickly when the gates to Hell open up all over Earth. Taking place across the globe is an apocalypse like no other, and humanity will find itself at war against a smart and merciless foe. Follow the struggles to survive with several characters as things go from bad to worse. Humanity is dwindling. Guy Granger is a Coast Guard captain in search of his kids. Mina Magar is a photojournalist taking pictures of horror she could never have imagined. Rick Bastion is a fading pop star with his head in a bottle and no hope for his future. Tony Cross is a soldier stuck on the Iraq-Syria border, but fighting insurgents is no longer a priority as a new threat emerges. Follow them all as they fight to stay alive. When the gates open, all Hell will break loose! Iain Rob Wright is from the English town of Redditch, where he worked for many years as a mobile telephone salesman. 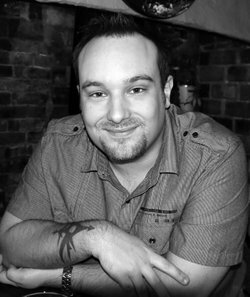 After publishing his debut novel, THE FINAL WINTER, in 2011 to great success, he quit his job and became a full time writer. He now has over a dozen novels, and in 2013 he co-wrote a book with bestselling author, J.A.Konrath. The three most important things in his life are his wife, his son, and his fans. His work is currently being adapted for graphic novels, audio books, and foreign audiences. He's an active member of the Horror Writer's Association and a massive animal lover. Join his mailing list and receive five FREE books, as well as all the latest news and releases. Help Support Confessions of a Reviewer! If you use Amazon to buy books or indeed anything at all, you can help support Confessions of a Reviewer and keep me working hard to make it as enjoyable as I can for you by using the links below to shop, at no extra cost to you!